ESEA bill getting close to passage in Congress. What will change once No Child Left Behind is gone? 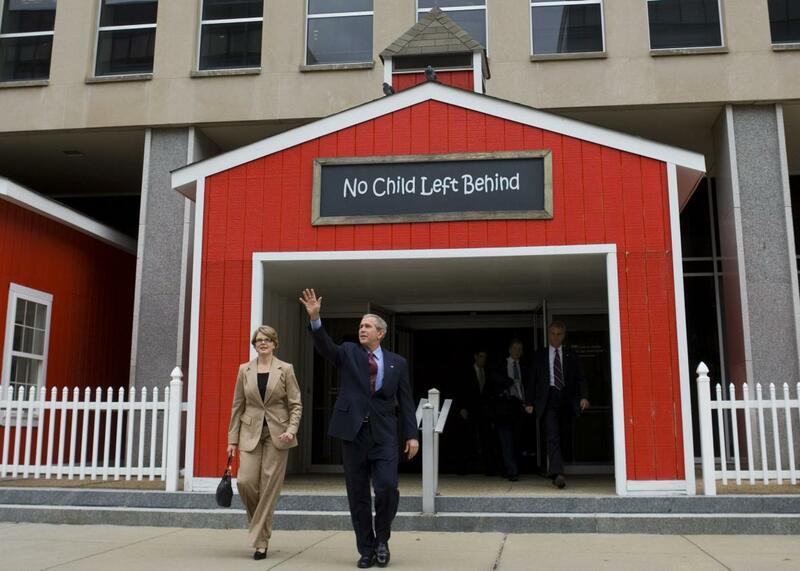 Congress Is Close to Replacing No Child Left Behind. So What Will Change? President George W. Bush and Secretary of Education Margaret Spellings walk out of the Department of Education building, Oct. 5, 2006, in Washington, D.C.* Congress is finally set to replace Bush’s signature education bill. Is Congress finally gearing up to pass a new version of the Elementary and Secondary Education Act? Over the summer, both the House and Senate passed rewrites of ESEA, an LBJ-born initiative that dramatically increased the federal government’s role in K–12 education. But until last week, the question of whether those two bills could be reconciled into any sort of compromise that both houses of Congress could embrace remained very much up in the air. Three weeks ago, when I interviewed a wide range of education policy experts for a story on Obama’s apparent change of heart on standardized testing, no one would commit to more than an educated guess in the “hopeful but by no means certain” range. While different in many details, both bills passed this summer represent a big shift of power from the federal government to states and local school districts. But now things on Capitol Hill are trucking along, and it’s looking likely that there will be a new ESEA for the first time since its last iteration, the now universally reviled No Child Left Behind, became law nearly 14 years ago. NCLB expired in 2007, and for the past eight years, while Congress has fitfully failed to rewrite the old bill, the federal Department of Education has adopted a haphazard, piecemeal approach to K–12 education, offering states waivers from NCLB’s very specific (and impossible to hit) targets. [W]e are recommending to our leadership … to take the next step in replacing No Child Left Behind. Because of the framework we’ve developed, we are optimistic that the members of the conference committee can reach agreement on a final bill that Congress will approve and the president will sign. But other than that, and in most other ways, this new ESEA gives power back to the states, which would now be in charge of fixing their most embattled schools, evaluating their teachers, deciding which tests to administer, determining how to use those tests to rank schools, how to educate dual-language learners, and on and on and on. In other words, we might finally be turning the corner on the era of federal micromanagement of K–12 education and leaving No Child Left Behind behind. If President Obama actually signs this unicorn bill, states and districts will have more power and Washington will have less. How this shift will change actual schools that actual kids attend, for better or worse, remains totally TBD. We know that NCLB was a gigantic bureaucratic debacle; we also know that states haven’t always been the most responsible stewards of children’s education. So for now, we can only sit back and hope that Congress gets it right, or a little righter than before. Correction, Nov. 18, 2015: This post originally misstated when NCLB became law. It was signed into law in January 2002, not November 2001. Also, due to an error by the photo provider, the initial image in this story misidentified the Department of Education building in Washington, D.C., as the Friendship Public Charter School’s Woodridge Elementary and Middle campus.